Marine Corps photo by Corporal David Bessey, 2014. 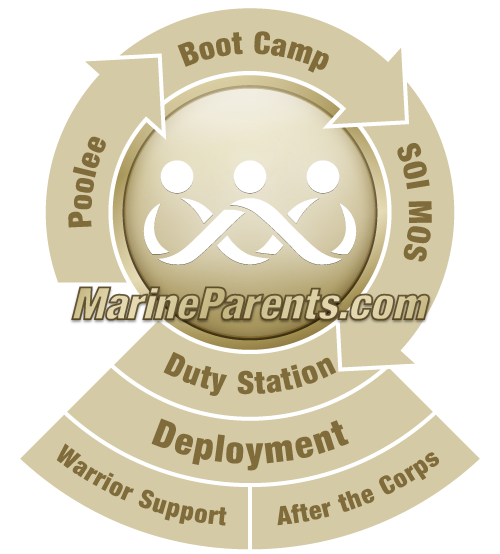 Information on this page comes directly from the official MCRD Parris Island website and the official MCRD San Diego website. During the first two weeks of recruit training, recruits will send home a letter stating they've made it to MCRD and will provide an address for which to receive mail. All mail is routed through the only mail office on the depot. Your mail will not reach your recruit without the correct COMPANY AND PLATOON NUMBER. The mail office will see that information and sort the mail to that company and platoon. The company and platoon information will be listed on the letter your recruit sends home about 2 - 3 weeks into training. For information regarding mail and letters from recruits, click here.